The Electoral Commission yesterday published the financial donations made to our political parties in quarter three of this year. They’re not the most fascinating read ever, but I like statistics and numbers so I tend to take a look at them. They also draw attention to a couple of interesting facts. The first fact that leapt out at me was the surprising one that UKIP raised roughly 25% more than the Liberal Democrats. UKIP are considered pretty much a fringe player in Britain, with no MPs, while the Liberal Democrats are a party of Government. So it’s a little strange that they can’t attract more donations. It would be reasonable to conclude that it’s indicative of how serious people take the Liberal Democrats if they’re not getting any money even when they (supposedly) have the power to affect change on behalf of those donors. Pretty much what you’d expect the Tory line to be, so all is right with the world. They even include a breakdown of the main union’s donations. This is then followed by the Tory party’s main donors, in order I suspect to show that they’re not under the spell of the unions. And this is the part that made me laugh. After pointing out that 80% of Labour’s donations were split between 2,272,000 people, and getting a minister to complain about it, they then show us that almost one-third of Conservative party donations came from one man. 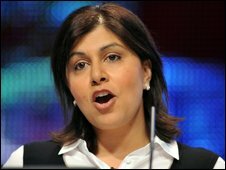 Baroness Warsi may well complain about Ed Miliband having to pay attention to the collective voices of 2 million+ workers who pay the political levy, but surely that’s nowhere near as bad as David Cameron being under the influence of a single person?